Lamb is one of my favorite meats to cook because it’s one of the hardest meats to perfect. It can easily be overcooked, under seasoned (leaving a heavy gamey flavor in the meat) or poorly cut (you end up chewing through fat and muscle more than meat). Preheat oven to 425°F. Arrange two racks in the oven – a middle rack to hold the lamb, and a lower rack to hold a roasting pan with which to catch the drippings. Place the empty roasting pan in the oven while the oven is pre-heating. Note that this arrangement of racks and pans, with the roast sitting directly on the oven rack, will create a natural convection of heat in the oven, causing the roast to cook more quickly than if cooked the traditional method in a rack in a roasting pan. Roast at 425°F for 20 minutes. Then reduce the heat to 300°F and roast an additional hour (for a 6 pound roast), about 10-12 minutes per pound. In the lower pan, put some fingerling potatoes tossed in olive oil. The drippings will give the potatoes flavor and make the outsides crispy. These are the best potatoes I’ve ever had. My latest obsession is Japanese curry. I had it at Curry House in Cupertino and looooved it so very much. Of course, new obsession means I’m going to cook it at least a dozen times until I perfect it. You can make Japanese curry from the S&B curry bricks or make your own curry roux base and freeze it. Either way, you’ll have curry bricks ready to melt into water for a quick meal anytime! Above, I made a simple ground beef and onion curry over whole wheat spaghetti. 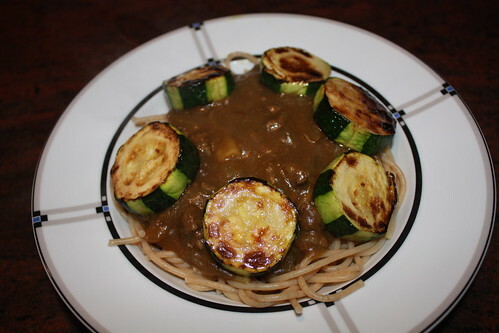 I topped it with sauteed thick slices of zucchini, my favorite gourd, which is an idea I got from a Japanese curry restaurant I went to. One of the topping options was zucchini and it tasted great with the curry! This took about 20 minutes total. Below, I had potato and onion curry over some of my leftover char siu fried rice from a few days prior. Very simple and helped me get through my leftovers. Every time I tell my friends I eat ramen a lot, they seemed shocked because I’m the active chef amongst us. However, my ramen is often a feast! Korean Nong Shim shin ramyum – a thicker noodle with a spicy soup. I usually only use half the soup packet otherwise my mouth is on fire and I can’t taste anything. The classic Chinese CQYD by Nissin – a delicious, more typical ramen style noodle that doesn’t get soggy if it sits in the soup for a while. There are at least a dozen flavors and XO Sauce is by far my favorite. Sau Tao ho fun – a thin, flat rice noodle with a great soup base. Mushroom or chicken abalone are delish! Matsuda rice vermicelli noodles also hold up well and have a good soup base, but I buy them in the bag and not instant bowl. My family made wontons on occasion when I was a child, so I’ve followed what I remember of my parents recipe with some of my own modifications. This will make roughly 2/3-¾ of a package of wonton skins. Chop up the bok choy so it fits into a food processor. Turn it on “chop” until you get small pieces, but not too fine. Do the same with the shrimp, being sure you have peanut sized pieces and not shrimp paste. Stir together in a large bowl with the ground pork; add seasonings, mix well. Beat in egg until well incorporated. Then follow this awesome tutorial by Rasa Malaysia on how to wrap a wonton. Voila, you’re done! Shui gao recipe is pretty much the same, except I add more shrimp than pork. Maybe 2/3 lb. shrimp, 1/3 lb. pork. I also add in about half a finely shredded carrot and 3 finely chopped shitake mushrooms. Don’t add beaten egg, though. Wrap with shui gao wrappers, which are round instead of square like wonton wrappers, and finish with a shui gao press (you can buy this at an Asian discount store for $1). Adding the chopped up bok choy to your wontons or shui gao adds a fluffy, lightly crunchy flavor to the dumpling. Recipes usually call for 1 tbsp. of cornstarch to achieve this, but I like the taste of the bok choy. 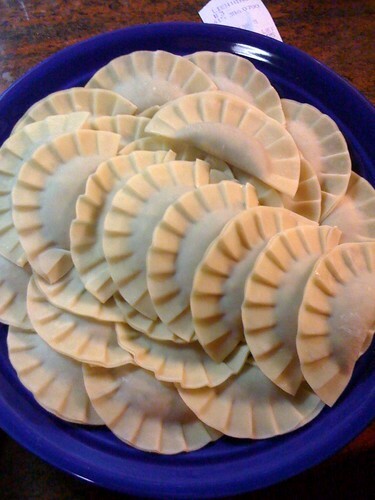 Freezing the dumplings are easy – just freeze them on a plate in a single layer for an hour to two, then throw them all in a ziploc freezer bag. To cook, just add to boiling water until they float, which indicates their doneness. So back to the ramen. I add a bunch of extras to my ramen to make a whole meal out of it – some fish cake, wontons and/or shui gao, enoki mushrooms, seaweed and poached egg. This makes a hearty meal that’s also quick and easy! My friend Joe asked me about the cost per serving of my ramen.. I calculated it out to be roughly $1.25 for each meal. A bowl of ramen at my favorite ramen shop is ~$9 with tax and tip. My favorite part of the Rasa Malaysia recipe is the “egg well” that produces the perfect, fluffy, bite sized pieces of egg in the fried rice. With all my ingredients, my fried rice was pretty delicious and I made enough for leftovers and lunches this week. The stuff surrounding the fried rice is garlic and honey glazed egg plant. I salted the eggplant slices and let them dehydrate on a paper towel for 15 minutes – this is important because it reduces the water content of the egg plant and also removes some of the bitter flavor. Next, I brushed the eggplant lightly with honey and sauteed them in olive oil that had slices of garlic. This imparted a nice sweet and garlicky flavor to the eggplant and was healthy! Since I’ve been eating a B.R.A.T. (bananas, rice, apple sauce, dry toast) diet for almost a week now and felt a bit better last night, I attempted to have some canned chicken noodle soup. That didn’t sit well with my stomach and I had another miserable day. I didn’t sautee the vegetables or add any seasonings at all – just threw in the veggies with the simmering liquids for 30 minutes. It’s important to leave the cooked pasta in the cooking water so it will soak up as much water as it needs and not soak up the soup liquids when you add it. Also, poached chicken breast was important to my diet since I hadn’t eaten any protein in days, but was still sensitive to fats. After eating the delicious soup, I feel better. This is a good introduction back to food after being so sick I couldn’t eat. 2 cups of miso mix for 4 eggplants? No way. I didn’t know what to do with 2 whole cups of the miso mix and decided to distribute it evenly over the eggplants. WAY TOO SALTY. Ended up scraping off the excess miso and eating the eggplant with a touch of the miso. I would suggest half the miso mix or double the eggplants next time. Pan seared the eggplants in a sautee pan first, instead of broiling them pre-miso basting. I’d make this again, maybe even with different vegetables like zucchini. My family has a traditional “special” meal during holidays like Thanksgiving and Christmas, which usually consists of seafood. This year, we decided to have a go at boneless leg of lamb since the demo station at Costco had excellent samples. They had a very simple recipe – sauteed cubes of lamb with Montreal steak seasoning. We bought the smallest leg we could find – 3.5 lbs for $15. Montreal steak seasoning was one of those items we didn’t want to buy because we’d never use it again, so I decided to make my own since we had all the spices in the house. Some seasoning, olive oil and soy sauce made a delicious marinade. Most of the effort was in cutting up the leg of lamb and removing all the fat. The marinaded cubes of lamb were sauteed in a wok over medium heat for ~10 mins until they were medium. 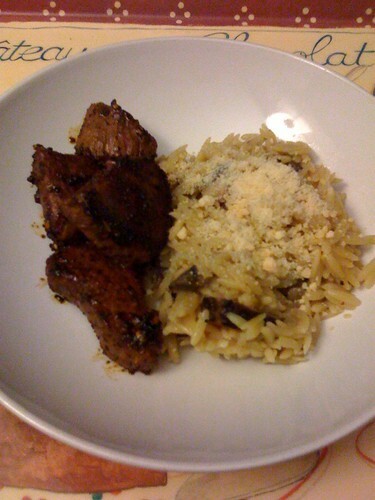 Delicious, especially paired with my favorite mushroom orzo! I was pretty proud of my holiday meal, especially since this was the first complete meal I had made for my family.